For Non-Reciprocal Passive Optical Components such as isolators, circulators switches, and Interleavers. All thick film Faraday rotator materials from II-VI are RoHS compliant. Bismuth-doped rare-earth iron garnet thick films are the principal Faraday rotator materials for non-reciprocal passive optical devices in telecommunications applications. These garnet materials are highly transparent at the principal near-infrared telecommunications wavelengths. Combined with the correct polarizing or birefringent elements, these Faraday rotators can be made into polarization dependent and independent isolators as well as incorporated into a host of other non-reciprocal devices including circulators, switches and interleavers. 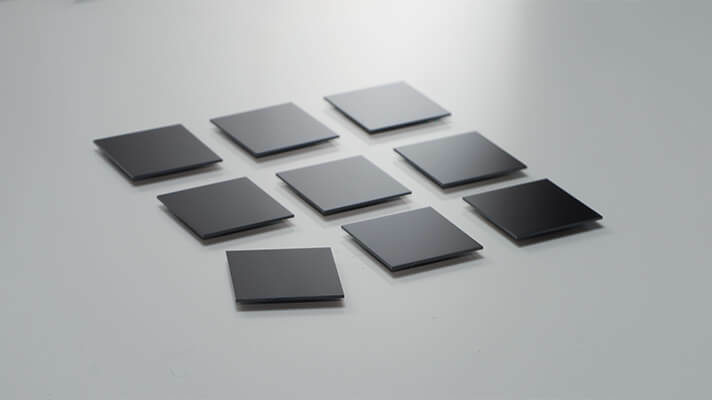 Increasingly magneto-optic materials are also of interest for sensor applications. All II-VI’s thick film Faraday rotators have been third-party certified to be in compliance with the European Union’s Restriction of Hazardous Substances (RoHS) directive. II-VI’s low moment FLM Faraday rotator provides a good compromise between low temperature dependence and low saturation magnetization. Our low loss FLL Faraday rotator is optimized to give low insertion loss across the telecommunications bands 1290-1610 nm (IL ≤ 0.05 dB @ 1550 nm, 0.02 dB typical) and offers other important design advantages. Our low temperature dependence FLT Faraday rotator is designed to provide the lowest temperature dependence of the Faraday rotation angle in our product line for uncooled and wide band applications. Our Latching MGL Faraday rotator enables the construction of devices without the use of a bias magnet, freeing the device designer from constraints of positioning, packaging materials, thermal mass and volume.